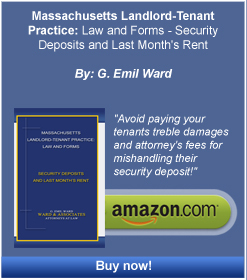 Class Action Defense - Boston Real Estate Attorney. Eviction Law. Zoning and Variances. Housing Discrimination. Ward & Associates has been very successful in recently defeating three class actions at the motion for certification stage where the landlords were accused of violating the security deposit statute. Having written a separate book, available on Amazon.com, covering security deposits, the firm is well-versed in the intricacies of security deposit claims as exemplified through the successful defenses in the three cases. If you are interested in a consulting relationship or a defense of a security deposit class action case, please contact us.